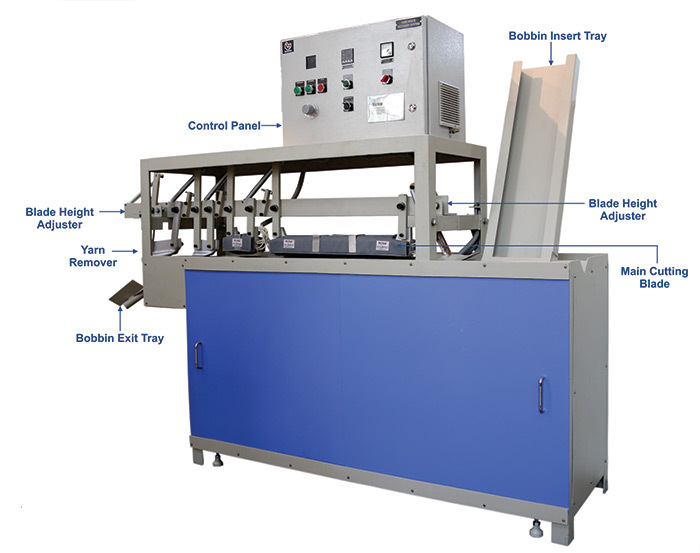 This machine is designed and developed for cutting waste yarn from bobbin of the tape plant machine. This machine is elctro-mechnical integrative. This machine can cut the waste yarn from the bobbin by sharp and hot heated blades with high efficiency. when a bobbin goes through this machine, it gets clean easily from the waste yarn and waste fell down beside the bobbin. This machine saves man power with more production than manual waste yarn cutting. Our latest technology power saving jacket saves power and maintain the environment suitable for working by preventing excess heat loss. Saves power up to 35% with the new technology energy saving jackets. Low man poer required as machine is Semi-automatic. Temperature of the blades is controlled by a precise controller which can be varied according to the requirement. It is Time and Money saving as production rate of the machine is very high in comparison to manual cutting. It is easy to operate and can be operated by an unskilled operator. No moving parts near operator working space which ensures safety of the operator.